Sorry for the delay in posting, but as you can imagine things have been a little crazy around here. The reason we haven’t posted any baby photos or info on our blog is that we want it to be private, only available to family and friends. So, we will be creating a new private blog for baby-related stuff. We sent an email with a link to baby photos to people that we know regularly check our blog. If you didn’t receive this email and would like access to the new site when it is ready, send an email to baby@deweyltd.us and we will put you on the short list. Our baby girl was born just before 8:00 this morning. Mother and baby are doing very well. More details to follow, so stay tuned. Description: About 3-5 inches long, yellow to orange in color. Three of the cutest little goldfish you have ever seen. 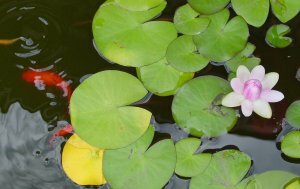 Lost when: They went missing from the pond in my backyard sometime between Friday, Sept. 12 and Monday, Sept. 15. If anyone has any information as to their whereabouts or the cause of their disappearance, it would be greatly appreciated. I understand your confusion, but no, it really is a tomato. 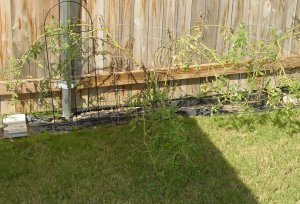 The explanation is simple, my plants have done nothing but grow all summer long and now resemble vines more than bushes. This particular plant is the worst. I have. You can’t really see them in the photo, but this particular plant is already being supported by two different cages as well as the cage of the plant next to it. The problem is that the branches are around five to six feet long, so they just grow right out over the supports of the cage. As you can see, it is a sad state of affairs in our garden right now. 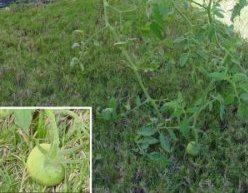 But at least I finally have a tomato (a $20 tomato if you figure in all the expenses associated with planting and watering the garden all summer). 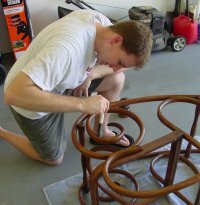 Last Saturday Hurricane Ike moved through Texas so I took the opportunity to stay inside and work on some of my many projects. I have been working on various pieces of our bedroom set for quite a while and this weekend I finished a five-drawer dresser. I bought it online, unfinished and unassembled. 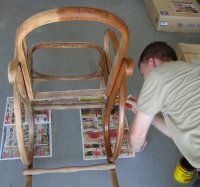 I started staining and finishing the pieces as I worked on my rocking chair—while one was drying I was busy with the other, how’s that for multi-tasking! Putting the pieces together was a bigger task than I initially thought it would be (if I had a dollar for every time I’ve said that recently, I’d be a very rich man). Assembling the frame of the dresser was a breeze, but getting the drawers assembled was no small task. One mis-aligned track or slightly angled screw would cause the drawer to stick out funny when it was closed or prevent it from rolling smoothly. I finally figured out a good method for aligning the rails (thanks to some timely help from Kim) and finished the dresser by mid-day. In the picture below you can see my handiwork. 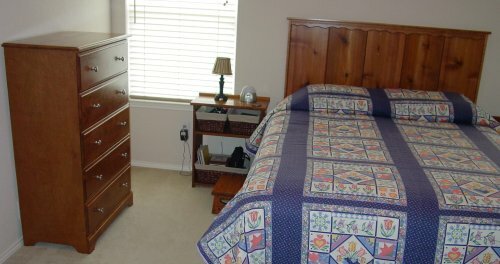 What you can’t see in the picture is my other project: fitting the food storage under the bed. We had been using the office closet to store our food storage, but since that room is becoming the nursery we needed to move some of it elsewhere (you can add the amount of room food storage takes to my long list of underestimations). We found some three-inch wood bed risers that match the rest of the bedroom set and gave us the perfect amount of room to store boxes of #10 cans. We also have a bunch of pouches, so we bought an under-bed storage box that perfectly fits nine pouches. So now every inch of non-visible under-bed space is filled. Pretty resourceful, huh? Next up on my project list: sand and paint our old dresser for use in the baby’s room. 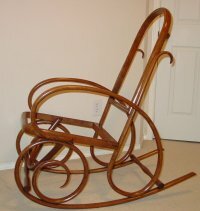 When I last left you in the rocking chair saga, the chair had been de-caned, stripped, and sanded (that sounds like some sort of torture method, but I assure you the chair liked it). I remember being a little concerned about how the chair would end up looking because at that point it looked really washed out and grey. 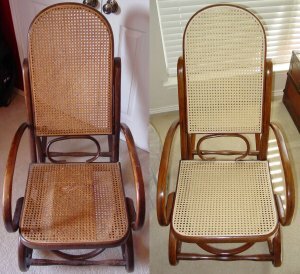 However, as I applied the stain, I couldn’t believe the way it brought the chair back to life. It really brought out that grain of the wood and started showing details that I didn’t even know were there. Next came the polyurethane finish. That was a little tricky because the chair has so many vertical and upside-down surfaces. I had to make sure I didn’t get so much stuff on one area that it would drip or run all over. After I applied two to three coats of finish, it was looking good. 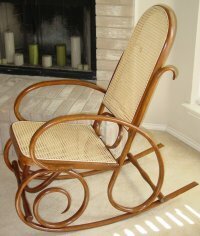 All that was left was to redo the caning for the seat and back. This was the part that made me the most nervous because I had no idea what I was doing. Before you can put the caning in, you have to soak the caning and spline in water for about two hours. 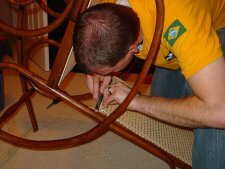 For a proper caning installation you are supposed to have some special caning wedges that are used to force the caning into the groove of the chair. Then you can just tap the spline into the groove, let it dry, and voila! Well, as is customary, I like to do things the hard way. 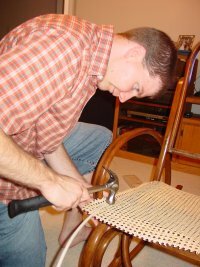 I didn’t have any of the special caning wedges, so I just decided to put the caning over the chair and hit the spline with a hammer until it went into the groove. I really shouldn’t have been working with a hammer right after finding out that my car needed $500 in repairs, but amazingly enough I got the caning in, and it actually looks pretty good. My projected three-week project has finally come to a close nearly four months later, but it really does look like a brand new chair.